New haircut and Me in the Gucci inspired vintage dress!! After doing my post on the dress-see below, I was intrigued to see what belts I had would go best with the dress, hence a try on session ensued. I tried on a couple of black belts that have gold in them but I thought this cream leather studded belt, which is from River Island, but was thrifted (£2.49), went with it best. I was brave enough to do a bare legged look, but I will wear the dress with opaque tights and black ankle boots too. My hair was in desperate need of a cut, so I went for a bob, a lot more manageable now!! Absolutely love that dress, it is very Gucci. Don't you just love Frida Giannini? The haircut suits you too, I'm in desperate need of a cut, it's been over 3 months, eek! Hi fablously broke-Thanks so much!! Hi fashion dreamer-thanks for your lovely comment, yes I was overdue too! Another brilliant find and the belt looks great. I'd try a fucshia suede one as well - if you've got one - otherwise save your pennies! Wow, amazing dress and the haircut is very fabulous on you. I wish I had the face shape to pull of that kind of cut, you're so lucky!!!! Your hair really does look great, and that dress is lovely on you too - the colours are perfect for you! The haircut ...so pretty, great with the dress too. Thanks so much for reading and commenting. lovely dress, you are right, is very Gucci! Hi bronwyn-thanks!! I'm still getting used to it shorter, thanks!! Hi Kate-I'm always subconciously looking for exactly a fuschia suede or leather belt-still looking! !Thanks for your lovely comment! Hi Ms peelpants-thanks for your wonderful comment, I'm still getting used to my hair, haha!! Hi Skye-thats a lovely comment, thanks so much my dear! Hi ellie-always so lovely, thanks!! Hi deb-thanks my dear, it was in bad need of a cut!! Hi atelier-thanks a lot, pleased you think so too! Hi eelie-so kind of you, thanks so much!! I love your new 'do', so sleek and Gucci-esque and is the dress. You look fantastic with your new hairstyle and that beautiful dress, Sharon. The belt is just the perfect touch for it, love your choice. Looks GREAT! kudos for having the guts to go for it. i want a bob too but can't seen to talk myself into cutting. I love your new hair cut! The dress is fab and the shoes killer! Hi Imelda-thanks so much for your lovely comment, so kind of you!! Hi Ida-you're so lovely, thanks very much my dear!! Hi culture creators-thanks so much!! Hi savvy-I really needed the cut, without going too short!! Hi always in style-thanks for your wonderful comment, so kind my dear!! Oh, your hair looks so cute! Hi nothing elegant-so kind, thanks!! i lovee this dress on you. that gucci collection was amazing. The dress is great but I love love LOOOOOVE your hair! Well done, girl. Wonderful print on that dress. I like the dark color around the shoulder area and then the way it works it way to the bottom of the skirt. Great find!! You look so beautiful!! Great new haircut and I love the dress, amazing. You look fantastic my dear!! wow i like ur new cut! :) so chic! Hi sal-oh thanks so much my dear!! Hi budget chic-thanks, it is quite unusual!! Hi toni alexis-thanks a lot!! Your last outfit is mouth watering ) great! Guau, you´re really beautiful. I see you´ve got a good hairdresser. how did i NOT see this haircut sooner? it's fresh, fun and hip. love it! hi cupcakes and cashmere-always so lovely, thanks a lot!! You look fab! 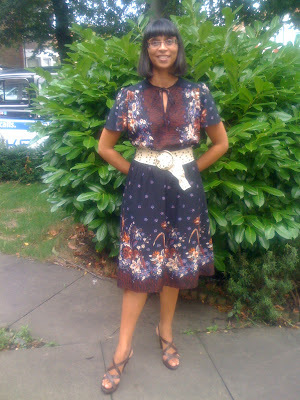 the bob really suits,great length for your face,darling you are working that outfit and the cream belt was a fab choice! Hi marian-thanks so much for your lovely comment!! You look positively beauteous! That's a lovely dress and you look lovely in it. Love, love, love the hair! Hi cheryl lynn-thanks so much for such a lovely comment! Hi alicepleasance-so kind of you, thanks a lot!